Yeesh .... no posts this month. I could say I was super-busy traveling and while it would be partly true the other reason is I have no writing ideas. The weather gods have been dithering between summer and fall, so I've been going around wrongly dressed for almost every event- flowy, sleeveless dress and flip-flops on a miserably rainy day, completely covered for a sunny barbecue and so on. I guess it would help to check the weather every morning but that would require a more planned person than me. I wish fall would just get here already!! Getting the new items to fit into our luggage was a challenge, since we already traveled with over-stuffed bags! I did find a new way of packing, apparently if you roll your clothes you can get a whole lot more stuffed into the same space. I did pity the customs guys if they happened to open those suitcases, items were apt to roll out every which way. Anyway, we got back with nothing missing so all's well on that front. Anyways, so I decided I'd just do a round up of some events. 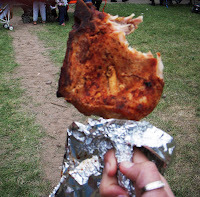 The first was the food at the Minnesota State Fair- everything fried and preferably on a stick! 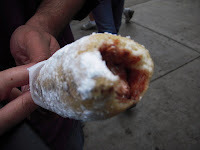 I've spent a lot of time scoffing at the deep fried chocolate thingy on the left but honestly, it's doughnut batter with melted chocolate in the center and sprinkled with sugar. What's not to love? The only sound I could make after eating this started with an m and ended with the same, I'm pretty surprised I actually had the fortitude to take the pic before I gobbled the rest up. The turkey leg was just plain scary! The next was an end of summer barbecue. I made these delicious bacon-wrapped jalapenos in two batches; one as in the recipe and the other with a spot of honey in the jalapenos for the timid. I grilled them but next time I think I'll use the oven since our grill was very hot and it ended up charring the poor things. But, they were so much fun to eat and disappeared in a couple of minutes. I didn't get many nice pics though, so check out the original recipe to see some absolutely drool-worthy pics. And lastly, due to the aforementioned writing slump there's been a decided lack of reviews. But, I did start reading a new author Nalini Singh's Psy-Changeling series and have been steam-rolling my way through them. I've read 2 books and the world is just so intriguing, detailed and complicated, I'm loving it. It's based in an alternate reality where there are three races - humans, changelings and the Psy and Ms. Singh goes into the details much more clearly than I can. I started reading the author after picking up her new series Angels' Blood a few months ago, based in another alternate reality setting with vampires, angels and humans. Do pick both series up if you like paranormal reads, they're rich in world-building, the characters are fascinating and the books are well thought out and well-written. However, this brings me to something that bugs me with romances and their covers , more specifically the tacky covers even the good books seem to end up with. If I hadn't been intrigued by the author's other series I would never have picked the Psy-Changeling series up solely based on the cover art. I know it's publishers who make the cover decisions so I wonder why they cannot understand that if people are embarrassed to be seen with the book cover they will not buy the book (i'm talking the impulse buys here). Atleast that's how it works in PapayaLand, I wonder if anyone feels differently? Anyways, that's about all for this rambling post, how was your weekend folks? 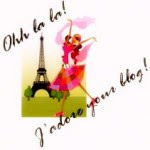 ... or a desperate attempt to update this blog! This was made when I had a ton of zucchinis in the house (an enthusiastic farmer's market purchase) and was running out of things to make with them. Since this is not an original recipe I'm not posting it to the food blog, it's made from Smita's delicious recipe for Cabbage with a spicy twist. Because I love the flavors of the original I've been trying various versions of it. 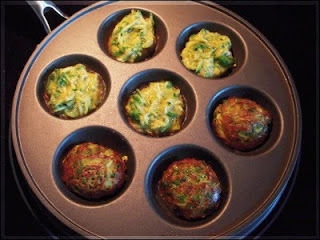 The one below is for a zucchini kofta curry. Mix together, there's no need to add water. Drop the batter (I used a spoon) into an appe / ebelskiver pan or deep fry them as usual. This wasnt an original idea, it's been borrowed from the amazing food blog world - needless to say I love it and have been using this pan to do all my deep frying in. While the koftas are frying chop coriander leaves, onions, tomatoes and slit some green chillies. 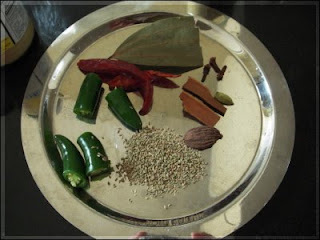 Spices clockwise from left: slit green chillies, red chillies, bay leaf, clove, cinnamon stick, green cardamom, black cardamom, ajwain (carom) seeds. In a little oil add all the spices. After a couple of minutes add the onions. 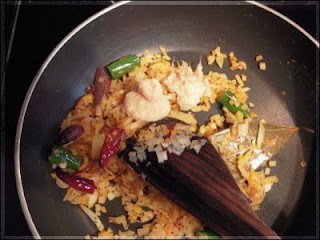 Fry till transparent and add turmeric/ chilli powder. 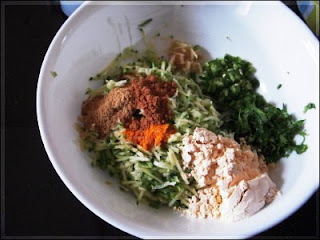 After a few minutes, add ginger and garlic paste. 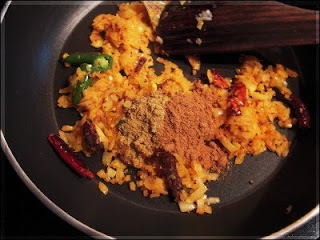 After another couple of minutes, add the cumin and coriander powders. Fry well. 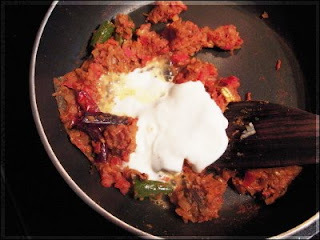 After the masala is fried (couple of minutes) add the chopped tomatoes (or tomato puree if you dont like lumpy gravies), once they have been fried well add well-beaten yogurt (or for added richness cream can be added but do this as the final step after the one below). Mix well. 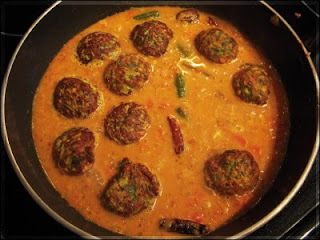 Add some water, drop the koftas into the curry and let simmer until desired consistency is reached. 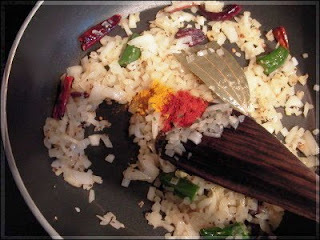 Garnish with coriander leaves and serve hot with rice/ chapattis/ parathas.